Electrochemical Machining (ECM) is the controlled removal of metal by anodic dissolution in an electrolytic cell in which the workpiece is the anode and the tool is cathode. The electrolyte is pumped through the gap between the tool and the workpiece, while direct current is passed through the cell, to dissolve metal from the work piece. ECM is widely used in machining of jobs involving intricate shapes and to machine very hard or tough materials those are difficult or impossible to machine by conventional machining. It is now routinely used for the machining of aerospace components, critical deburring, Fuel injection system components, ordnance components etc. ECM is also most suitable for manufacturing various types of dies and moulds. For the first time ECM is developed for educational institutions, after years of experience and expertise demonstrating various aspects of electrochemical machining technology. The set up has robust construction, reliable and sophisticated technology, user friendly operation and is easy for maintenance. Extra care is taken while designing for operator safety by providing various protections. One can study various aspects with investigative experiments by this single set-up. Comparison of theoretical and observed Metal Removal Rates ( M.R.R.). 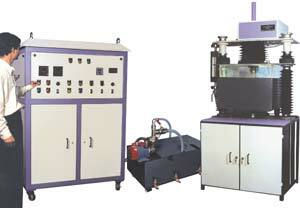 Accuracy and over cut produced at different feed rates, voltage etc. Machining of metals difficult to machine by conventional methods. There are many other experiments possible depending upon ingenuity of user. The job to be machined is fixed in the vice, in the machining chamber, that is sealed for any leakage of electrolyte and is corrosion resistant, having window to see machining operation. Tool is brought near the job with the help of press buttons provided on the control panel and table lifting arrangement, maintaining particular gap. The tool progress is manoeuvred vertically by servo motor and is governed by micro controller based programmable drive. Then the process parameters are set like tool feed rate, voltage, timer, auto/manual mode, etc. The process is started in the presence of an electrolyte flow that is circulated with the help of special pump filling the gap between anode ( job ) and cathode ( tool ). Electrolyte flow is adjusted by flow control valve. The machining is achieved by sinking of tool forming its replica. During the operation sophisticated control panel takes care of any damage to the machine by over load and short circuit protections. After desired time interval hooter gives an indication of completion of the time / process. The small machining area with given power supply an be machined within 30 mins. to one hour. 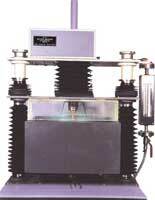 This electro-mechanical assembly is a sturdy structure, associated with precision machined components, servo motorised vertical up / down movement of tool, an electrolyte dispensing arrangement, illuminated machining chamber with see through window, job fixing vice, job table lifting mechanism and sturdy stand. All the exposed components, parts have undergone proper material selection and coating / plating for corrosion protection. Tool area - 30 mm2. Cross head stroke - 150 mm. Job holder - 100 mm opening X 50 mm depth X 100 mm width. Tool Feed motor - DC Servo type. The power supply is a perfect integration of, high current electrical, power electronics and precision programmable microcontroller based technologies. Since the machine operates at very low voltage, there are no chances of any electrical shocks during operation. voltage from 0 - 20 V.
Power Factor - Better than 85. Protections - Over load , Short circuit, Single phasing. Operation Modes - Manual / Automatic. Timer - 0 - 99.9 min. Tool Feed - 0.2 to 2 mm / min. Supply - 415 v +/- 10%, 3 phase AC, 50 Hz. The electrolyte is pumped from a tank, lined by corrosion resistant coating with the help of corrosion resistant pump & is fed to the job. Spent electrolyte will return to the tank. The hydroxide sludge arising will settle at the bottom of the tank & can be easily drained out. Electrolyte supply shall be governed by flow control valve. Extra electrolyte flow is by- passed to the tank. 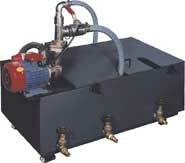 Reservoir provides separate settling and siphoning compartments. All fittings are of corrosion resistant material or of S.S., as necessary. Tool design for electrochemical machining is a subject by itself. 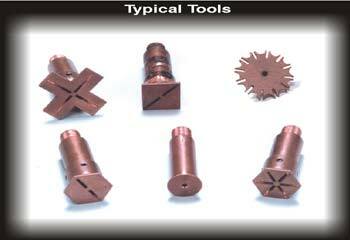 In ECM generally tool which is cathode, is made out of non reacting material such as Copper. Industrial systems can also be developed pertaining to specific jobs manufacturing requirements like Dies manufacturing, Critical deburring, Gun barrel machining, Nozzle cleaning, Air Bag, Antilock break systems components, Fuel injection system parts, Hydraulic Components, Pneumatic Components, ABS Parts, Transmission Parts, Aerospace components, Medical components, Firearms & Ordnance components etc. and many such more .